This may arise from hypothalamic-pituitary disease or from long-term steroid therapy leading to hypothalamicpituitary- adrenal suppression. 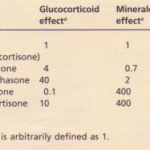 Most patients with the former have panhypopituitarism and need T4 replacement as well as cortisol; in this case hydrocortisone must be started before T4. 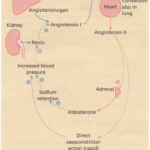 The commonest cause of hypoadrenalism is long-term corticosteroid medication for non-endocrine disease. The hypothalamic-pituitary axis and the adrenal may both be suppressed and the patient may have vague symptoms of feeling unwell. The long ACTH stimulation test should demonstrate a delayed cortisol response. Weaning off steroids is often a long and difficult business. Cushing’s syndrome is the term used to describe the clinical state of increased free circulating glucocorticoid. It occurs most often following the therapeutic administration of synthetic steroids; all the spontaneous forms of the syndrome are rare. 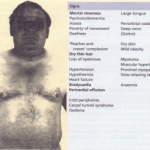 The predominant clinical features of Cushing’s syndrome are those of glucocorticoid excess and are illustrated. PIGMENTATION only occurs with ACTH-dependent causes. A CUSHINGOID APPEARANCE can be caused by excess alcohol consumption (pseudo-Cushing’s syndrome)- the pathophysiology is poorly understood. IMPAIRED GLUCOSE TOLERANCE or frank diabetes are common, especially in the ectopic ACTH syndrome. HYPOKALAEMIA due to the mineralocorticoid activity of cortisol is common with ectopic ACTH secretion. 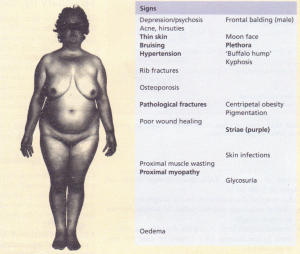 indicates signs of most value in discriminating Cushing’s syndrome from simple obesity and hirsuties. 24-HoUR URINARY FREE CORTISOL MEASUREMENTS. Repeatedly normal values (corrected for body mass) render the diagnosis most unlikely. 48-HoUR LOW-DOSE DEXAMETHASONE TEST. Patients with Cushing’s syndrome fail to suppress plasma or urinary cortisol levels. The overnight dexamethasone test is unreliable but has occasional value in excluding the diagnosis. CIRCADIAN RHYTHM. After 48 hours in hospital, cortisol samples are taken at 0900 and 2400 hours (without warning the patient). 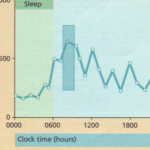 Normal subjects show a pronounced circadian variation; those with Cushing’s syndrome have high evening cortisol levels, though the 0900 value may be normal. INSULIN TOLERANCE TEST. This is useful in depression or obesity, when abnormal circadian and suppression responses are seen. The normal rise of cortisol with hypoglycaemia does not occur in patients with Cushing’s syndrome. This can be extremely difficult. The classical ectopic ACTH syndrome is distinguished by a short history, pigmentation and weight loss, unprovoked hypokalaemia, clinical or chemical diabetes and plasma ACTH levels above 200 ng litre “. Severe hirsuties/virilization suggests an adrenal tumour. ADRENAL CT SCAN. Adrenal adenomas and carcinomas causing Cushing’s syndrome are relatively large and always detectable by CT scan. Carcinomas are distinguished by large size, irregular outline and signs of infiltration or metastases. PITUITARY CT OR MRI. Of less value than the adrenal scan; only a minority of tumours of significant size are detected with confidence by CT, and indeed over 80% of skull X-rays are normal. MRI may be superior. PLASMA POTASSIUM LEVELS. All diuretics must be stopped. Hypokalaemia is common with ectopic ACTH secretion. Failure of urinary or plasma cortisol suppression suggests an ectopic source of ACTH or an adrenal tumour. The metyrapone test has been shown to be of little value. PLASMA ACTH levels. Low or undetectable ACTH levels «10 ng Iitre””) on two or more occasions are a reliable indicator of non-ACTH-dependent disease. CRF TEST. Exaggerated ACTH responses to exogenous CRF suggest pituitary-dependent Cushing’s disease. CHEST X-RA y is mandatory to demonstrate a carcinoma of the bronchus or a bronchial carcinoid. Lesions may be very small; if ectopic ACTH is suspected, whole-lung and mediastinal CT scanning should be performed. Further investigations may involve selective catheterization of the inferior petrosal sinus to measure ACTH for pituitary lesions, or blood samples taken throughout the body in a search for ectopic sources. Bronchoscopy, cytology and regional arteriograms are occasionally necessary. Treatment options are surgery, radiotherapy and medical control; the choice remains controversial. Trans-sphenoidal removal of the tumour, by an experienced surgeon, is the treatment of choice. Selective surgery nearly always leaves the patient ACTH deficient immediately postoperatively, even after CRF, and this is considered a good prognostic sign. Transfrontal surgery is very rarely necessary because most tumours are small, though they are occasionally locally invasive. Yttrium implantation of radioactive needles in the fossa produces good results in some centres but it is not generally available. 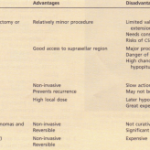 External irradiation alone is very slow, only effective in 20-50% and of little value except in those unfit for, or unwilling, to have surgery. Children, however, respond much better to radiotherapy, 80% being cured. Medical therapy to reduce ACTH (e.g. bromocriptine, cyproheptadine) is rarely effective and bilateral adrenalectomy is now very little used, though remains an effective last resort. poor. In general, if there are no widespread metastases, tumour bulk should be reduced surgically and the adrenolytic drug op’DDD given; new preparations have reduced the side-effects of nausea/vomiting and ataxia. Some would also give radiotherapy to the tumour bed after surgery. Ectopic tumour sources should be removed if possible. Otherwise chemotherapy/radiotherapy should be used, depending on the tumour. Control of the Cushing’s syndrome with metyrapone is beneficial for symptoms If the source is not clear, cortisol hypersecretion should be controlled with medical therapy until a diagnosis can be made. This rare syndrome is of increased pigmentation associated with an enlarging pituitary tumour occurring after bilateral adrenalectomy. The tumour may be locally invasive but most physicians believe it can be prevented by pituitary radiotherapy soon after adrenalectomy, though the latter is now rarely used. Incidental adrenal tumours (‘Incidentalomas’) With the advent of abdominal CT scanning, unsuspected adrenal masses have been discovered in = 1% of scans. 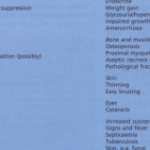 These obviously include the described adrenal tumours but cysts, myelolipomas and metastases are also seen. If found functional tests to exclude secretory activity should be performed; if none is found then most authorities recommend removal of large (>4-5 ern) and functional tumours but observation of smaller lesions.